Hatteras and Ocracoke islands were gratefully spared the bulk of Hurricane Florence ? a fact that was lost on no one in the community. Even the Dare County Board of Commissioners focused on the sheer luck that moved Florence away from a direct hit to the Outer Banks at their Monday meeting, with Emergency Management Director Drew Pearson commenting that the line between minimal damage and devastation was ?a matter of 50 miles to the right.? But because this is a community that is all too familiar with the destruction and months of rebuilding that a storm can cause, islanders from Rodanthe to Ocracoke turned their attention inland. The Down East region was hit hard by Florence, and it did not take long for grassroots and more organized support efforts to start popping up in abundance. On the Sunday following Florence, Cape Hatteras Electric Cooperative sent four volunteer linemen to Carteret County to help with the roughly 30,000 folks who were still without power after the storm, while organizations like the North Carolina Fisheries Association asked for both information on damage and assistance in providing help and supplies to those affected. CHSS Foods and Nutrition Teacher Evan Ferguson and her class prepared comfort food to send along to East Carteret County High School, while the Cape Hatteras United Methodist Men ? a longtime resource for islanders after a storm ? started planning a large relief effort, asking for both volunteers and funds. Local businesses like the Cape Hatteras Motel started fundraising campaigns as well, asking visitors staying at the motel to bring along a non-perishable item or two for folks in need. Community members joined in the effort on individual levels too, with Hatters and Ocracoke islanders using trucks, boats, and trailers to make a trek to the Down East community, and drop off much-needed supplies. During this mass effort, which began just hours after Florence?s impacts to the mainland became clear, social media was teeming with folks asking and offering to help, as initiatives of all varieties took shape. The Florence response from Hatteras and Ocracoke islands is still ongoing. Islanders know all too well that the devastation from a hurricane takes weeks and months to overcome, and these efforts to help our southern neighbors will continue until that help is no longer needed. And whether community members participate by making a donation, or by hopping behind the wheel themselves to deliver a truckfull of supplies, the fact that our community gives and gives and gives regardless is something to be proud of. I remember covering the aftermath of Hurricane Hermine for our editor Irene Nolan in early September of 2016 ? a significant storm at the time, until Matthew followed just weeks later. After Hermine hit, heaps of smelly eelgrass and debris were piled into the yards of Hatteras village residents, leaving behind a mess that was virtually impossible to trek through. As customary during storms in Hatteras village, relief efforts were orchestrated almost immediately, with the Hatteras Fire Station serving as the hub for supplies and assistance. And on Labor Day ? a day when most folks are enjoying one of the last summer days on the beach ? the 70 volunteers of the Hatteras Island Community Emergency Response Team (CERT) were out tackling these big piles of stinking seaweed, while sweating in robber gloves and waders. Most of the volunteers had their own homes to worry about too, as Hermine brought 4-5 feet of soundside flooding, and with it, damage to a large number of residences in Hatteras village. But here they were anyways, on a hot and steamy Labor Day, helping the folks who needed it the most. ?Most able bodied families don?t call for help ? they can do it themselves,? a volunteer told me at the time. ?We?re helping the people who really need it, and that?s what?s important.? This sentiment stuck with me at the time ? as did the image of volunteers spending a humid morning wading through moist eelgrass ? because it perfectly captured what our community is all about. If you need help locally, we?re here. If you need help miles away, we?re coming. So with the ongoing initiatives to continually help folks dealing with Florence, and more trickling in on a daily basis, our community will surely continue to focus on what we do best ? giving back, as much as we can. Cape Hatteras United Methodist Men (CHUMM) – If you are able, you can join one of the CHUMM Emergency Response Teams (ERTs), or you can help sponsor the ERTs. Call the Volunteer Coordinator Dave Kelmer at 252-986-2719 or email at [email protected] to volunteer. For monetary donations, mail checks to CHUMM, PO Box 1348, Buxton, NC 27920. It’s important to put “Storm Relief” or something similar in the memo line so that funds will be designated for Florence recovery, and you will get a tax receipt. Hatteras Sol Waterside Grill – serving as a drop-off location for donations through Saturday night, September 22, as drivers will be making the trip south on Sunday. Lee Robinson’s General Store – serving as a drop-off location for donations through Saturday night, September 22, as drivers will be making the trip south on Sunday. 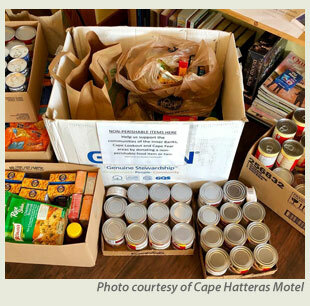 Cape Hatteras Motel – Collecting non-perishable foods until November 15. You don?t have to be a guest at the motel to participate to stop by and drop off a donation.